Pasta tossed in a truly good Alfredo sauce is an incredibly simple yet delicious dish which can come together in a matter of minutes. This makes it a perfect meal choice for a weeknight when one does not have time for something more involved, and yet you still want to create something delectable in the kitchen. The quick cook time and deep flavor also makes pasta Alfredo a great recipe to keep up one’s sleeve for lazy weekends, or for impromptu dinner guests. No wonder Alfredo pasta is a favorite dish among many! The reason why Alfredo sauce is so simple and quick to make is because it basically only involves melting butter, and parmesan cheese and combining this with pasta to create the perfect storm of flavor and smooth texture. This is the classic, or authentic, way to make Alfredo sauce, and it was apparently ‘discovered’ by an Italian man called Alfredo. Who was attempting to make something that his pregnant wife would be able to eat. From this alleged day onwards, Alfredo sauce has made culinary history, and been adapted and built upon to include additional ingredients such as lashings of cream and cream cheese. There are also many slightly differing techniques to make Alfredo sauce, but they all boil down to melting everything together, and combining it with perfectly cooked pasta. Alfredo sauce is often paired with fettuccine, or tagliatelle pasta. The logic behind using these wider and broader pasta shapes for Alfredo dishes is that their robustness holds up well to the rich and pungent sauce. Thinner pastas such as spaghetti and capellini can become overpowered by a strong sauce like Alfredo. For this recipe I have used tagliatelle pasta, however you are welcome to switch this out for whichever appropriate pasta you may have on hand. Just remember, the wider the pasta the better for flavor balancing. In the sauce we are sticking to the roots of the classic Alfredo, and using butter and parmesan as the base ingredients, and omitting the use of cream or cream cheese. What I do add is a small amount of additional flour and milk, as these two ingredients help to create a smooth emulsification in the sauce. Which is what you want in an Alfredo sauce, lovely smoothness without any chance of lumps developing. Before we get started, there is another valuable tip / trick I want to share with you for avoiding lumps and getting that divine silky texture. And it lies in the parmesan. If you want top notch Alfredo sauce, use a block of good quality parmesan cheese. Not only does it have a superior level of flavor, but there is another important reason why it is the best to use, as opposed to powderized or pre-grated parmesan which is not ideal for Alfredo sauce. Powderized parmesan that one typically buys in canisters, contains anticaking agents to keep it from making clumps. When you add this parmesan to sauces, it can often refuse to melt properly, resulting in a rough texture in your sauce. This is because the anti-caking agents have an inhibiting effect on the melting of the parmesan. So, for unctuous smoothness in your Alfredo sauce, and of course enhanced flavor, treat yourself, and go out and buy a block of nice parmesan cheese, if you do not have one in your pantry. Speaking of enhanced flavor, this Alfredo sauce is particularly pungent and flavorsome thanks to the extra step of adding garlic and rosemary to the melting butter. The flavors of these two ingredients seep and sizzle into the butter, and then go right through the sauce. If you love garlic and rosemary, then you absolutely must try this recipe! Assemble all of your ingredients. Grate the parmesan if it is in block form, strip the rosemary leaves from their stems and finely chop the garlic if you have not done so already. Fill a large pot with water (about 4 quarts for the ¾ pound of dried pasta). Set it onto the stove and bring to the boil. Once boiling, add 1 tablespoon of salt. Pour in the dried pasta and allow to cook uncovered on high, until al dente, approximately 7-9 minutes. Once cooked, drain the pasta without rinsing it, and reserve the water. Now set a large sized skillet or pan onto a medium to low heat. Add in the butter. 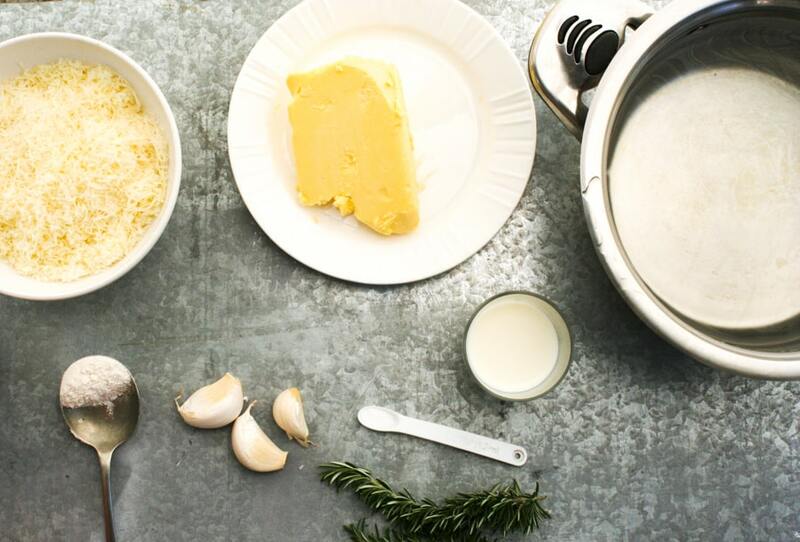 As the butter is melting in the skillet, add the rosemary and garlic to the pan, keeping the heat on medium low. Allow the rosemary and garlic to fry gently in the butter for about 10-12 seconds, stirring with a spatula to prevent the butter singing. As soon as the garlic shows signs of beginning to brown in places, add in the flour, stirring it into the butter. Immediately pour in the milk, and stir well to combine and avoid lumps. Now add in 1 cup of pasta water, stirring it in to combine. Then add in about a third of the grated parmesan, stirring to combine. Add the rest of the parmesan in two more batches, stirring continuously to ensure smoothness. If you find that the Alfredo sauce is too thick, you can add in a little extra pasta water to thin it. Lastly, transfer the cooked pasta into the sauce and toss gentle (tongs work well for this) to coat. Once again, if at this point you feel that the sauce needs thinning, you can add in a further small quantity of the reserved pasta water. Serve immediately, topped with freshly ground black pepper and a fresh rosemary sprig for garnish. Notes: Alfredo pasta is so delicious that it can easily be eaten on its own. However, if you want to balance the meal with some vegetables – steamed broccoli, a green salad, or roasted asparagus can make great sides. And if you want to do a celebration of the deliciousness of carbs, you can also pair it with a basket of sliced baguette to use to wipe up the leftover sauce on one’s plate. Leftovers will keep for up to a week in refrigerator. First up, assemble all of the ingredients. Grate the parmesan if it is in whole block form, finely chop the garlic, and strip the rosemary leaves from their stems. Fill a large pot with water, about 4 quarts worth. Place the pot on the stove on a high heat and bring to the boil. Once boiling, add a teaspoon of salt and the ¾ pound of dried pasta. Cook according to packet instructions, for 7-9 minutes or until al dente. Be sure not to overcook the pasta, as it will then be stodgy, and this texture can be exacerbated by the sauce once served. Once cooked to perfection, drain the pasta without rinsing, and keep the water. You will use some of this to add to the Alfredo sauce for thinning. To make the Alfredo sauce, place the butter in a pan and place on the stove on a low heat. While the butter is melting, stir it to avoid the edges of the melted butter from burning. While the butter is melting add in the rosemary and garlic. You may increase the heat slightly if it seems to be too low, but do not turn it up too much. Butter can burn very quickly, as can the chopped garlic. Keep stirring the pan while the garlic and rosemary is infusing into the butter. As soon as you see that the garlic is about to brown, add in the flour and quickly stir. Then pour in the milk and stir further to combine. Now add in 1 cup of the reserved pasta water. Stir, and then add in a third of the grated parmesan. Keep stirring and adding in the remaining parmesan in two further increments. As soon as the Alfredo sauce has reached a smooth consistency you can turn off the heat. At this point you can also taste and add additional salt if desired. If you do add additional salt, do so with caution, as the water from the pasta already contains some salt. Now add the drained pasta to the sauce, and toss to combine. You may find that your skillet is too small to accommodate all of the pasta. In this case, rather pour the sauce over the pasta in the large pot in which you cooked it. When tossing the pasta in the sauce, use a gentle hand to avoid ‘mashing’ the pasta. A pair of tongs works best for this step. If you feel that the sauce is too thick to evenly coat the pasta, you can add a little additional pasta water to thin it. Now that your perfectly cooked pasta and aromatic Alfredo sauce have been combined, the only thing left to do is serve! Serve immediately, and garnish with a fresh rosemary sprig and a sprinkle of freshly ground black pepper. As you can see, Alfredo sauce is incredibly simple to make. And if you have had a good Alfredo pasta dish before, you will also know that it packs a punch of flavor. Knowing how to make an off the charts Alfredo pasta dish is almost like having a secret weapon. Easy and quick to make and guaranteed to please. All you need is a good quality cut of parmesan and 20 minutes max. On a versatility note, Alfredo sauce is also a great base into which you can add additional ingredients. Mushrooms, chicken, peas, ham and shrimp are all great additionals that you can try. Simply sauté and add them in. In the case of ham, you do not even have to cook it before adding it to the Alfredo sauce. Alfredo pasta can also be dressed up and down in terms of sides. On its own it makes a delicious and effortless meal. Or it can be paired with bright salads, wilted greens, or steamed or roasted vegetables. Another versatile characteristic of Alfredo pasta is that can be served at almost anytime of the year. The comforting effects of steaming pasta in a creamy sauce will lift spirits in winter, while still being perfectly suitable for summertime meals as well. Really, what can’t one do with Alfredo sauce? Resist it perhaps! Do you have a favorite way to serve Alfredo pasta, or a favorite additional ingredient? If so, let us know in the comments.